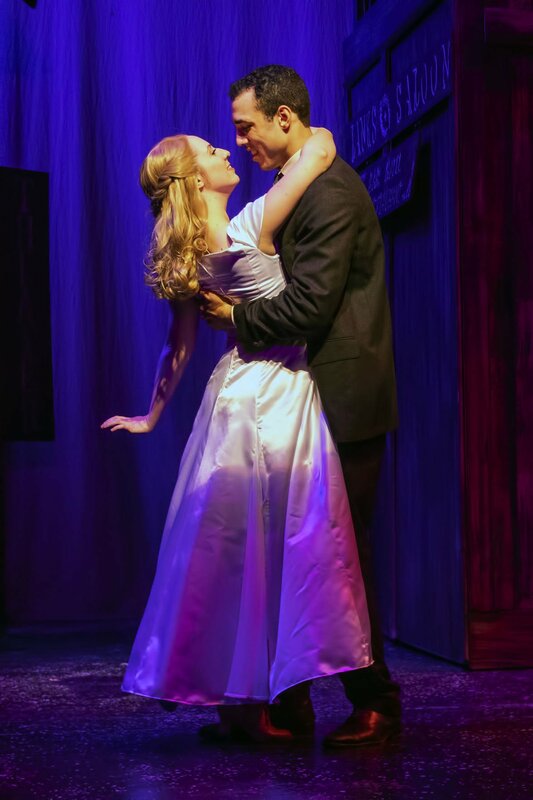 In the end, love triumphs, and Polly Baker (Tessa Ogles) and Bobby Chile (Tevin Joslen) agree to marry in "Crazy For You" playing at Stars Theatre Restaurant. The chorus girls of the Zangler Follies arrive in Deadrock to the astonishment of the townsfolk in a scene from "Crazy For You" playing at Stars Theatre Restaurant. Irene Roth (Kelsea Johnson), Bobby Child's fiancee, falls head over heels in love with saloon keeper Lank Hawkins (Brian Purcell) in "Crazy For You" playing at Stars Theatre Restaurant. Posing as Bela Zangler in order to impress Polly Baker, Bobby Child (Tevin Joslen) convinces the townsfolk to put on a show to save the theater in in "Crazy For You" playing at Stars Theatre Restaurant. Highly intoxicated, the fake Bela Zangler (Tevin Joslen) and the real Bela Zangler (Kevin McDonald) eye each other warily in a scene from "Crazy For You" playing at Stars Theatre Restaurant. While everyone is working on the final rehearsal for the show, the real Bela Zangler (Kevin McDonald) staggers into Deadrock in a scene from in "Crazy For You" playing at Stars Theatre Restaurant. Bobby Child (Tevin Joslen) is a banker, but what he really was to do is sing and dance on Broadway with the Zangler Follies in "Crazy For You" playing at Stars Theatre Restaurant. "Having been given the great task of directing was such a crazy thought for me at first, but I have thoroughly enjoyed my experience," the director wrote in an email. "The cast that (choreographer Jennifer) Skiby and I put together is probably the hardest working cast I have ever been a part of, both as an actor and director." When Bowles-Votaw heard that the theater had chosen the tribute to the music of Gershwin as the season closer, she tapped Skiby, who along with being a close friend is also a phenomenal dancer and choreographer, to bring it to life. The musical opens with New York banker Bobby Child (Tevin Joslen), who heads to Deadrock, Nev., to foreclose on a rundown theater. He hits a snag when he falls for Polly Baker, the theater owner’s spunky daughter (Tessa Ogles). Since the feelings aren't mutual, Child vows to use his wiles to win her heart and save the theater. "Having been in this show before as an actor, I have always loved the music of Gershwin and the songs that are incorporated into the show," Bowles-Votaw said. "Also, tap dancing is near and dear to my heart and this show is chock-full of it." She and Skiby determined early on that dance was key to their vision for the show. "The choreography is definitely the basis of the show. ... Skiby has outdone herself with 14 huge dance numbers (each number is over four-plus minutes). We both made sure that tap dancing was the main form of dance to be highlighted, but with a twist. We took the cast and pushed them, rehearsing over the Thanksgiving, Christmas and New Year's holidays and their hard work has definitely paid off." With a cast that also includes Kelsea Johnson, Brian Purcell, Jared Cantrell, Paula Einstein, Kevin McDonald, Randy Jelmini and Jolie Roberson, Bowles-Votaw said she was happy to have performers known for performing at other theaters in town to come together for "Crazy." "It's wonderful to see every 'home' theater from Bakersfield represented on that stage with this company," she said. "I would love to see the theaters in Bakersfield work more closely together and this cast is definitely a positive step in that direction." Featuring numbers that will make you want to dance and memorable music, the show is a good one to beat the winter blues, Bowles-Votaw said. "'Crazy For You' is a show full of happiness, laughter and just plain fun. In the world we live in today, I definitely feel we can never have enough of those particular qualities. "My hope is the audience leaves with a full heart and can exude and share happiness with people around them. Gershwin definitely has a way of making you feel light on your feet with a full heart."